Abdul Raouf Kara, the head of the of RADA (Deterrence) forces, one of the main security groups backing the Presidency Council, is being targeted by the alliance of hardliners and militants seeking to wrest control of Tripoli. 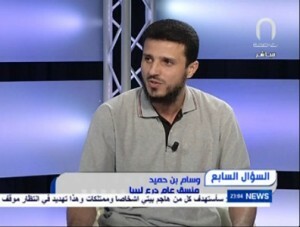 Wissam Ben Hamid, the former leader of Benghazi’s Libya Shield No. 1 brigade who fled the city last year and has since been spending time between Tripoli, Misrata and Jufra, yesterday accused Kara and Rada of being part of a “malicious clique”. In a video published by Benghazi Defence Brigades (Benghazi Saraya) which claims to be operating under the authority of grand mufti Sadek Al-Ghariani, Ben Humaid described Kara as a hypocrite who pretended to be on the side of the revolutionaries but in reality was no different to Khalifa Hafter. Ben Hamid also attacked the Presidency Council, Hafter and the French, alleging a conspiracy between the latter two and declaring that the mujahdeen would never give up until they had expelled “the invaders” from the country. As for the Presidency, it was a council of traitors intent on dividing Libya. Ben Hamid’s outburst came after the Presidency Council declared a three-day state of emergency in Tripoli amid fears that the militants planned to take over government buildings after demonstrations in Martyrs’ Square. Streets leading to the square were closed but although there hundreds tuned up to protest against both the French and the Presidency, there were no attacks. Kara is reported to be holding a number of IS and Ansara Al-Sharia supporters. Ben Hamid was accused last year of ordering the assassination of Mahdi Al-Barghathi, at the time commander of Benghazi’s 20 Tank Brigade, now the Presidency Council’s defence minister.